This is an urgent message to all those sitting on the fence on being a Quant Elite member..This MAY close tomorow! 1. I’m currently giving away six extended months for free with savings of $1000+. 3, Exclusive access to all my video playbacks of webinars that are not available to the general public. 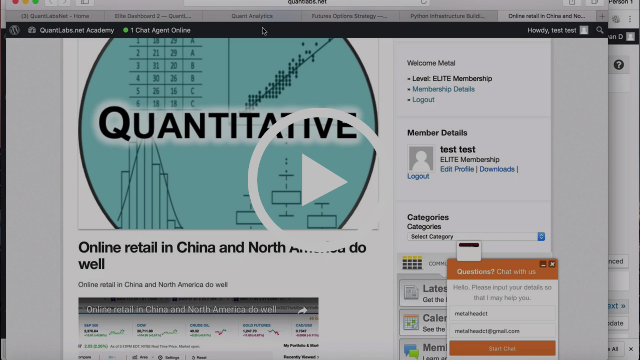 Watch this 30 minute video introducing you to our Algo Trading Analytics service. Think about it. They are as we just provide ‘dummy’ rules to generate market signals. Is there more depth to this you think? There is an article you can read for the details. This entry was posted in Premium Membership and tagged algo, foundation, trading on June 15, 2017 by caustic. This entry was posted in Quant Analytics and tagged foundation, Neuroscience, r Artificial Intelligence on October 18, 2015 by caustic. This video I show you how to leverage my community to become an extremely successful indie trader through various resources and technology you can leverage from. Also, I give an overview of all my trading algorithms, technologies and social media used to help you accomplish your goals. Moreover, I give many tips for those who are interested in career to get quant research jobs. Not bad eh? I even introduce you to my resource of 1000+ trading charts used to help traders in their market direction calls. I’m sure there are some skills that you never thought of that are needed to help you get to those upper levels. Over the years, dozens of various questions have been asked so I have made an extensive knowledge base of articles to cover my answers. This introduction is also included in my video. I also highlight the various course material to help you become a better automated trader which obviously includes high-frequency trading. This alone will save you multiple years of development and frustration. This includes various downloads, software, exclusive video playback’s, and source code. This entry was posted in Uncategorized and tagged foundation, Optimal, potential, trading on July 2, 2015 by caustic. This entry was posted in Premium Membership and tagged foundation, Optimal, potential, profit, trading on June 26, 2015 by caustic. The Importance of Knowing Trade Probabilities. Another way of saying quant analysis is the foundation of trading? This entry was posted in Quant Analytics and tagged analysis, foundation, Importance, knowing, probabilities, Quant, trade, trading on May 20, 2014 by caustic.